This is Part 2 of a 7 part series. When is the green tea leaf plucked during the harvest cycle? Biologists consider caffeine a defensive chemical for plants. Caffeine made by a plant is usually at the highest level when the plant is most vulnerable to predators. This is especially true during the beginning of the growth cycle or in spring. The leaves of tea plants have higher green tea caffeine content during the first spring plucking. In addition, the first spring plucking of leaves will have higher polyphenols or antioxidants like EGCG, and more delicious flavor and scent from aromatic chemicals. Because of all the beneficial and flavorful chemicals concentrating in spring, these first tea leaf pluckings have been the most highly prized of all teas for thousands of years. Which leaf on the tea plant did you buy? The most vulnerable leaves have the highest green tea caffeine content, as well as the sweetest flavor and the most antioxidants. The bud and first leaf can have around 50% more caffeine than the second leaf and lower leaves. What is the tea plant variety? The smaller leaves of Camellia v. sinensis generally used for green tea have less caffeine than the larger leaves of Camellia v. assamicus generally used for black tea. Green Assam tea is now available and may have slightly more caffeine than Chinese green teas. What are the agricultural practices and soil variations at your tea garden or estate? Tea plantations around the world have different agricultural practices. Shading the plants for a few weeks prior to harvest helps preserve the green tea caffeine content along with other desirable chemicals during green tea manufacture. Shading is used for Japanese Gyokuro and Matcha. Other parts of the world are starting to include this technique for some of their harvest. Soil variations will create minor differences in caffeine content of the tea leaf. There may be tea plant caffeine differences between organic tea agriculture and mainstream chemical agriculture. What are the annual weather variations on the tea garden or tea estate? If the weather is more cloudy before and during harvest, that will help to increase the caffeine in the leaf. Which tea manufacturing and tea processing techniques did your tea company use? Between the time your fresh green tea leaf is plucked from the plant and the time you make tea from the dried leaf, your leaf may have been cleaned, steamed, withered, oxidized, pan-fired, roasted, bruised, rolled, twisted, cut, dried, crushed, powdered, flavored, or scented. Some of these processes will change the caffeine content. 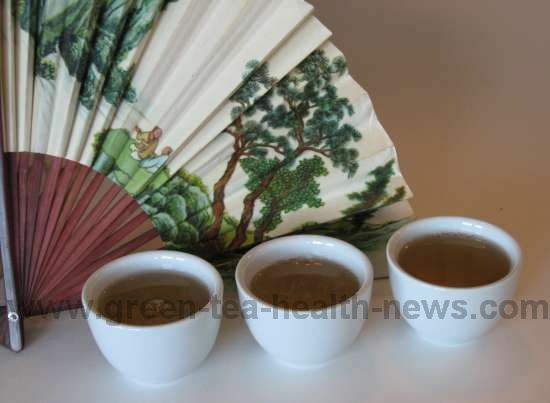 In general, the most commonly used black teas test at twice the caffeine content of green tea. But a gourmet bud and first leaf tea like Dragon Well or a shaded tea like Gyokuro can test as high in caffeine as some black teas. A new processing technique using far infrared radiation is being tested for use instead of roasting. This radiation technique increased green tea caffeine content, but it also increased vitamin C, and almost doubles the valuable polyphenols and catechins like EGC and EGCG (Kim, 2006). What is the size of your finished tea leaf? The smaller the size of your leaf means it has a faster release of all chemicals into water. Teabags release both caffeine and antioxidants rapidly and are used up with one infusion. Whole leaf teas like the rare and gourmet Dragon Well, Pi Lo Chun, Lu’ An Melon Seed, Lu Shan Yun Wu, and Gyokuro can be infused two to three times per serving. Those leaves will release their chemicals slowly while giving you more cups of tea to enjoy. Do you know which laboratory equipment was used to measure the green tea caffeine content? The analytic equipment itself can vary in accuracy. For instance, chemically modified electrodes may be more accurate than glassy carbon electrodes. Currently the most reputable information comes from HPLC or high performance liquid chromatography (Manken, 2000). That’s the cute little box that costs U.S.$20,000, just like the ones they use in the TV show CSI. And as of, 2011, independent labs may charge as much as $2,000 to test a single sample. Miniaturized spectrometers which can give the same results with a dramatically reduced cost are being developed and may achieve mass production by 2016 (Micro Electro Mechanical Systems (MEMS) from Fraunhofer Institute for Photonic Microsystems IPMS in Dresden, Germany). This technology could allow increased testing in rural areas, and eventually home use, or even cell phone apps. But until you can afford to test every cup of tea that you drink (got $2000? ), you'll have to rely upon your own knowledge (and this website!) to help you. How much caffeine in a cup of green tea? What about decaffeinated green tea?